4.1.3. Place the sample in a thermal cycler and incubate the sample at 94°C following the recommendations in Table 4.5.1 below for fragment sizes ~200 nt. Refer to Appendix A for fragmentation conditions if you are preparing libraries with large inserts (> 200 bp). Conditions in Appendix A (Chapter 6) only apply for intact RNA. 4.4.2. Add 144 μl (1.8X) of resuspended beads to the second strand synthesis reaction (~80 μl). Mix well on a vortex mixer or by pipetting up and down at least 10 times. 4.6.5. Add 3 μl (blue) USER Enzyme to the ligation mixture from Step 4.6.4, resulting in total volume of 96.5 μl. 4.7.2. Incubate for 10 minutes at room temperature. 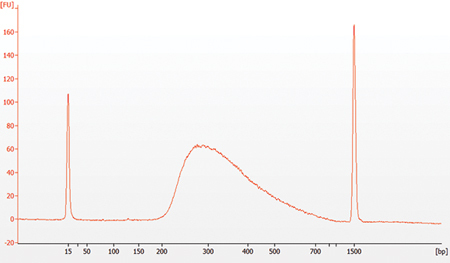 Note: If a peak at ~ 80 bp (primers) or 128 bp (adaptor-dimer) is visible in the Bioanalyzer traces; Bring up the sample volume (from Step 4.9.9) to 50 μl with 0.1X TE buffer and repeat the SPRIselect Bead or NEBNext Sample Purification Beads Cleanup Step (Section 4.9).